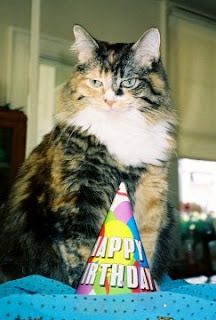 The photo is of my cat "Matilda" It was taken by me on her third Birthday last year. I love Matilda very much. She brings much joy into my life! Giving and helping, rather than taking is more important to me. I volunteered at the YMCA for 21 years teaching aerobic dance. 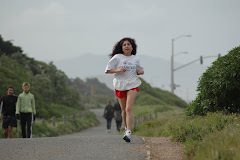 I still volunteer for the running community and other organizations, being the volunteer coordinator, social chair, and more. Being of service to the community, helping whomever I can, and being a good example are ideals I live by. I think people would be happier and more content with life if they practiced these principles. It is important to give back what you have been gifted and blessed with. Matilda has taught me what unconditional love is all about: my love for her and her love for me. She is very special and wonderful.